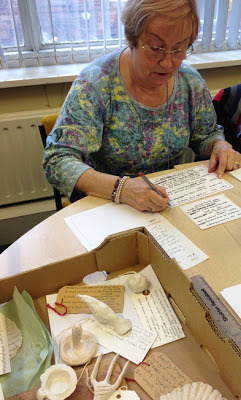 We've been working with a group of carers at Warrington Museum, trying out ideas for re-labelling museum objects, using emotional connections with the artefacts rather than historical ones. It's the personal associations with the objects and the memories triggered that we've been most interested by. The stories that emerged have contained a whole human mix of funny, tragic, absurd, strange, haunting and haunted. This week we tried something different. Rather than looking at the objects, we looked at labels instead. Our participants were then invited to make labels in traditional museum style, but instead of writing about objects, describing people important to them and categorising them in the same way a traditional museum label might do. In a way this was an anti-labelling exercise, because it pointed up the absurdity of labels - it's impossible to adequately describe another human, let alone encapsulate them in a short definition. But as a writing constraint it's an interesting one and produced some touching little portraits, defined as much by what they left out as what was on paper. Christine made a delightful word picture of her father, pipe-smoking, flat-capped and with a twinkling humour. But where to put it? 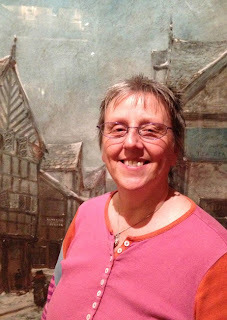 She imagined it working well alongside a picture of old Warrington (see photo below) or else in a bare room containing only her dad's flat cap. Sylvia's description of a friendship that's lasted 54 years was full of affection. Perhaps the most emotive piece was Derek's description of his son's attempts to escape the bubble of schizophrenia. Christine in front of 'Old Cheapside, Warrington' 1886, George Sheffield. While researching this workshop I put the search 'poem labels' into google and was rewarded with various pieces of writing that were attacks on labels, stereotypes, etc. But having looked closely at museum labelling, I begin now to realise what an art making a label is. And how useful as a boundary to put around people's creative writing, because – paradoxically – it set them free.